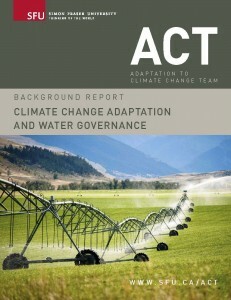 OCT 4, 2011 Coordinated national and regional water conservation guidelines are required to address the detrimental impact climate change is having on Canada’s water system, according to Simon Fraser University’s Adaptation to Climate Change Team (ACT). The report calls for a dramatic reform of water governance structures in Canada by all levels of government to meet the new challenges posed by a changing climate, and sets out 12 broad-based recommendations to help protect Canada’s fragile water supply. Climate change is causing increased weather instability, leading to more frequent, deeper and persistent droughts, as well as more intense rainfall and flooding across Canada. This results in greater property damage, higher insurance costs and a greater infrastructure maintenance and replacement deficit nationally. Today, half of every dollar paid out by insurance companies is for water damage related to extreme weather events, which will continue to increase unless government and planners undertake the deep reforms necessary to manage water differently. The growing economic impacts of climate change on Canada were confirmed by a national study released last week by the National Round Table on the Environment and the Economy (NRTEE). According to NRTEE, the costs of climate change could range from $5 billion per year in 2020 to between $21 billion and $43 billion per year in 2050, depending on global greenhouse gas emissions and domestic economic and population growth. Water policy in many parts of Canada has not kept pace with changing political, economic and climatic conditions. The last federal water policy was tabled in Parliament over two decades ago and has never been fully implemented. And today, less than 20 percent of Canada’s groundwater sources have been mapped. One of the key challenges limiting effective water resource management in Canada is jurisdictional fragmentation, as legislative power over freshwater is divided between the federal government and the provinces, producing a complex regulatory web that spans First Nations, municipal, regional, provincial and federal orders of government. This has resulted in serious policy and information gaps contributing to a lack of legally enforceable water quality standards and contributing to the decline of surface and groundwater monitoring, as well as water research in Canada. The complexity, fragmentation and lack of coordination of water policies in Canada creates policies that are often inconsistent with respect to drinking water quality standards, ecosystem protection, allocation rights and climate change adaptation, concludes the Climate Change Adaptation and Water Governance report. “The reform of water governance structures in Canada is essential if we want to successfully manage and protect our water supplies and minimize climate-related impacts on our environment, our economy and our society,” says Sandford. For the full report, please visit Water Security in the Reports section of this website. Hello! I agree that water resources should be used carefully and only if needed. Besides, it is necessary to pay attention to the changes in climate and react correspondingly. The nature provides us with information how we should behave, we just need to listen to it. Thanks for your opinion on this sometimes controversial subject. signed up for your RSS feed, but is there also a newsletter for your blog? I didn’t spot where to register on your site.